Elizabeth is over at Velvet Ashes today . . .
And that is what I think of when I think of myth: I think of story. I think of narrative. So when I use the word myth to describe the Bible, I’m not saying it’s not true – because I most certainly believe it is true. Rather, when I say the Bible is myth, I’m saying that it’s full of stories that infuse meaning into our lives and that it is, in actuality, one overarching Story. 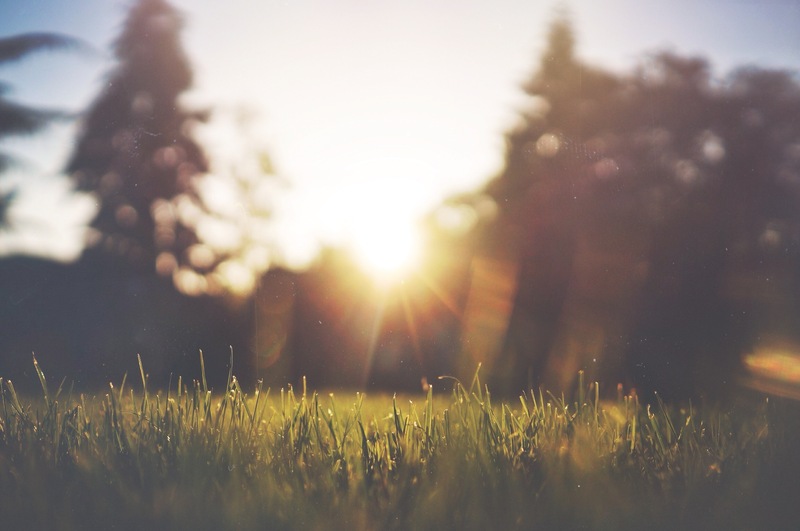 The God of the Bible audaciously makes a world, joyfully populates it with creatures, and then willingly redeems those creatures from sin and death. This story is unlike any story humans have ever told. Indeed, the Bible’s uniqueness among world myths is one reason I believe it, love it, and base my life on it. When Missionaries Starve — A message on the Power, Beauty, and absolute Necessity of the Word of God. Recorded at ICA, Phnom Penh Cambodia, July 2017. Click the link above to listen to the mp3, or check out the trotters41 podcast here. I also wrote about this topic over at A Life Overseas. I have NEVER been a morning person. I have therefore never had a morning quiet time. I’ve tried afternoon, evening, and not-at-all, none of which worked long-term. About 6 months ago, something stirred inside me and I wanted more time with God. I knew I had to start small. I started with 10 minutes. Yes you read that right. 10 minutes before the kids are allowed out of bed. (Yes there is a rule about their wake time, and thankfully my kids are old enough to understand and obey it.) Even that was hard. I kept pushing back the alarm 5 or 10 minutes, and eventually got to 30 minutes with God. Yes, I would like more, and no, I haven’t been able to move it back any earlier. Yet. Something that really helped me stick with an earlier wake time was not beating myself up if I missed a day. (That’s Grace, applied to time with God.) I know I can start again the next day. So I don’t let myself feel guilty if I miss a day. But if I miss a few days, I know I have to evaluate, because something’s off that needs tending. Getting up earlier requires discipline in going to bed earlier, and let me tell you, I am STILL not great at this. I still stay up too late sometimes and have a hard time getting out of bed. My introvert self really needs quiet time with God in the morning. Ironically, when my introvert self has been “socialed out,” I’m too exhausted to get up in the morning, thereby thwarting the very healing I need. Too much social interaction interferes with my ability to hear from God, and I just have to accept that fact. I think the surprising thing has been what has happened inside me since I made this commitment. Sometimes it doesn’t feel fruitful. But if I look back over the last several months, the fruit of peace and intimacy with God is clear to me. I’ve had lots of spiritual breakthroughs. I’ve fallen more in love with God and His Word. I’ve discovered I like reading it; it’s not just a duty anymore. I think that’s how I feel about my morning times with God. I don’t always get it right. Sometimes I skip and stay in bed. Sometimes I don’t get much out of it. Sometimes I read more than I pray. Sometimes I pray more than I read. Sometimes I sit and stew and worry. Other times I receive visions from God that impart deep, deep healing. All I know is that after several months of this, I have been changed, and getting up early is one of the best decisions I’ve ever made. And then, recently, I came across these tips for night owls like me. I had implemented several of them myself in attempting to get up earlier and was excited to know other people thought they worked too. And I LOVE the title “Hello Mornings.” For someone who’s not a morning person, it’s hopeful and helpful to look at mornings through such a warm and friendly lens. I especially like tips #3, #4, #10, #11, and #13. I’m sharing the link in the hope it can help someone who’s struggling to get up in the morning with God. A peculiar thing happens to me when someone lobs a Bible verse at me and lectures me on how to live my life: I feel trampled upon. I feel controlled and belittled. But when I read Scripture by myself, on my own, and happen upon some life-changing verse — even if it’s something someone else could have pointed out — then that verse is impactful and life changing. Perhaps this is my stubbornness, my sin nature. But I also believe it’s a testament to the power of the living Word. The Text itself has the power to change us when we encounter it ourselves. I think this is why Scripture readings in church, by themselves and without any commentary at all, can be so very powerful. When I have an encounter with God Himself, He speaks to my heart and tells me what to do. God’s Word is just so much more effective when God Himself is speaking to me, and not some angry know-it-all. Now, I’m not anti-sermon. I love good preaching and teaching. I love learning information, and I love hearing Bible commentary. What I dislike is having Bible verses thrown at me without love. The Bible is a living, breathing text, and we were designed to sit under it. To listen, to stay awhile, to be changed. It’s why I have to read it myself. It’s why I feel so much closer to God when I do. Even if I don’t see specific changes happening yet, God’s word is active under the surface of my heart and slowly, sometimes imperceptibly, changing my attitudes over time. I used to think prayer and Bible reading were separate (yet conjoined) endeavors. But maybe Bible reading is just listening to God talk to us. And if prayer is actually a conversation with God instead of merely my supplications, then listening to Him is one half of prayer. Which means that maybe, reading the Bible is actually . . . praying. Could that really be prayer? Isn’t prayer when we talk to God? But nothing is separated or segregated in our life with God. I can pray while I sing, and I can worship God without song, when I stand in awe of His creation. So it’s possible that prayer and Bible reading are the same thing sometimes. Prayer as Bible reading seems so mundane. It’s not fireworks or anything fancy. But it isn’t mundane. It’s God intersecting with the world. It’s God changing my heart – which is actually pretty miraculous if you ask me. I think sometimes we lose the wonder of a changed heart. 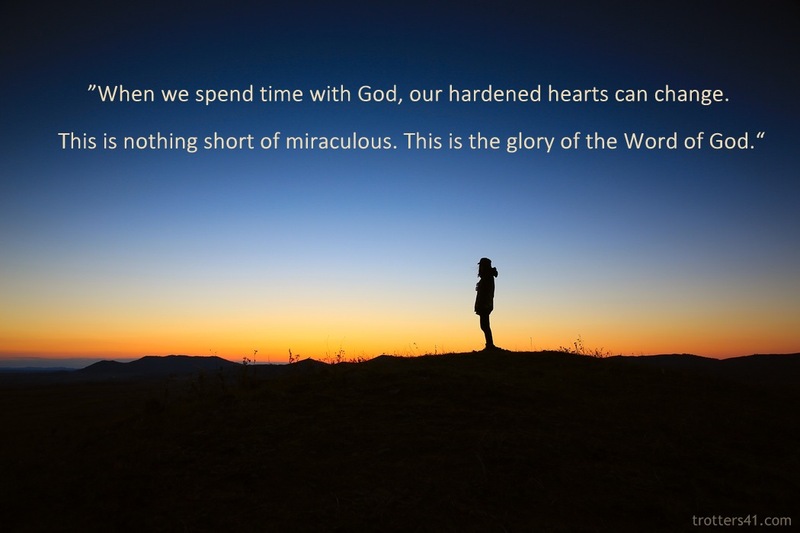 But the truth is, when we spend time with God, our hardened hearts can change. This is nothing short of miraculous. This is the glory of the Word of God.